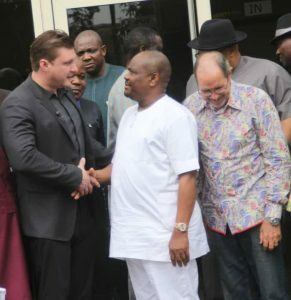 R-L: Rivers State Governor, Nyesom Ezenwo Wike, President, Christ for All Nations, CFAN, Evangelist Daniel Kolenda, Vice President, CFAN, Peter Vandenberg and Pastor John Duka during a visit to Government House Port Harcourt on Thursday by Evangelist Kolenda. 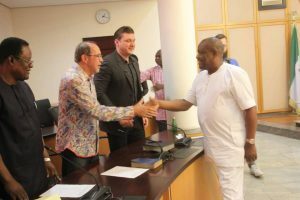 Rivers State Governor, Nyesom Ezenwo Wike (Middle), President, Christ for All Nations (CFAN), Evangelist Daniel Kolenda (l) and Vice President, CFAN, Peter Vandenberg during a courtesy visit to the Government House, Port Harcourt on Thursday by CFAN. Rivers State Governor, Nyesom Ezenwo Wike has berated the APC Federal Government for shielding Prince Charles of Wales from the neglected Niger Delta that produces the nation’s wealth. According to a statement by his aide on electronic media, Mr Simeon Nwakaudu, Wike made the remark when he granted audience to international preacher, Evangelist Daniel Kolenda at Government House Port Harcourt on Thursday. The Rivers State Governor also wondered what parameters were used in confining the Prince of Wales to Abuja and Lagos. He said the actions of the APC Federal Government in the course of the visit of Prince of Wales underscored the negativity that has characterised governance under the present administration. He said: “The Prince of Wales came to Nigeria and they took him to Abuja and Lagos. 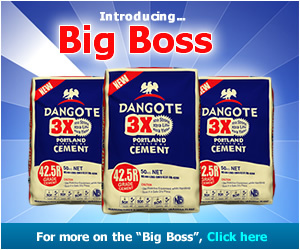 They didn’t want him to see the suffering people of the Niger Delta. “Look at the sitting arrangement of their photograph with the Prince of Wales and where they placed the producers of national wealth?”. He said that the action of the APC Federal Government is very painful. 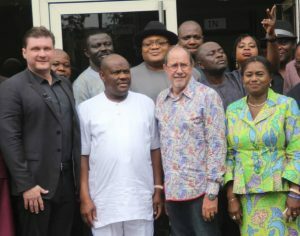 Wike commended the leaders of CFAN for coming to Rivers State, in spite what he called plots by the APC Federal Government to de-market oil producing states. On his part, Evangelist Daniel Kolenda of the Christ for All Nations (CFAN) has declared that God will exalt Port Harcourt this week. Speaking during a courtesy visit to the Government House, Port Harcourt on Thursday, Evangelist Kolenda said that God’s Special Power will sweep through the Rivers State capital to bless the people and empower them with the grace of recovery. He said that Nigeria holds a dear place in his heart because it was the first place where he preached and was also introduced as the new leader of CFAN. The cleric added that the resurrection power of God will manifest during the crusade, noting that God will work mightily. He said: “History will be made in Port Harcourt this week, the power of God will be released to bless the people”. The cleric noted that God will use Governor Wike to leave legacies of development across Rivers State because he has offered himself to work for his people. Responding, Rivers State Governor, Nyesom Ezenwo Wike said that God has ordained the crusade to hold in Port Harcourt because he is determined to bless Rivers people. Governor Wike said that Rivers people will participate actively in the crusade, noting that the State Executive Council will take the lead. He stated that his administration will continue to partner with the church to ensure peaceful co-existence and general growth. Earlier, Chairman of Pentecostal Fellowship of Nigeria, Rivers State, Apostle Zilly Aggrey praised Governor Wike for placing God first in all his activities. He said that God led Governor Wike to reclaim the NLNG land because he wanted to use it for the salvation of souls in Port Harcourt. Highpoint of the visit was the rendition of special prayers for Rivers State and Governor Wike by Evangelist Daniel Kolenda.